It was a sunny, humid 110 degree day in Houston. I was eating at one of my favorite sandwich shops, and suddenly, there it was. After scouring countless grocery stores, CVS chains and Target stores, my search was finally over. I had finally found a Diet Coke with MY name on it. Well, my boyfriend found it, but whatever. I took all the credit (Sorry Alex). After I plastered my new discovery on every social media channel I owned with the #ShareACoke hashtag, I realized just how genius this marketing truly was. I mean, don't get me wrong. I love me some Diet Coke (aspartame and all). But Coca Cola had me stopping every single time I saw a stand for Coke or Diet Coke. I mean I was flipping over every bottle and was even willing to pay the extra 20 cents so just so I could be one of the cool kids and put my picture on Facebook. It's personal and focused on the user. We've said it a million times. Your content needs to be focused on your customer and what they want to read or share.This content is as simple as different names on people's favorite drink. Even if you don't like Coke products, you're still looking for your name and you know it. Even in 12 pack cans, there's #ShareACoke with your homeboy, your family, your mom, your wingman. Nothing changed about their product. Coke made it all about the user. It was that simple. It's engaging and creates user generated content. The #ShareACoke hashtag is on every bottle. It's promoted everywhere. Everyday I see someone on social media posting the bottle they found with their name on it. The whole drive of this campaign is focused on shareability. Find your name, find your friend's names, find your significant other's name to earn brownie points. Then share it on social media. This campaign so effortlessly promotes user generated content that it's brilliant. Talk about free advertisement. Take my picture for example. It's on every social media channel that I'm a part of. It bridges traditional marketing with inbound marketing. I have already embarrassed myself talking about Tinder and Disney princesses. I'm sure it doesn't come as a big shock that I was excited when Diet Coke announced Taylor Swift was their latest spokeswoman. Despite the commercials of adorable montages of people young and old singing along to my favorite T Swift songs, it didn't make me stop twice in the grocery store. Until now! At Target there are retail stands set up just with personalized names. It's traditional marketing, but the personalization aspect draws the user in and makes the user want to search for their names and friend's names. It infuses traditional marketing with inbound marketing perfectly. 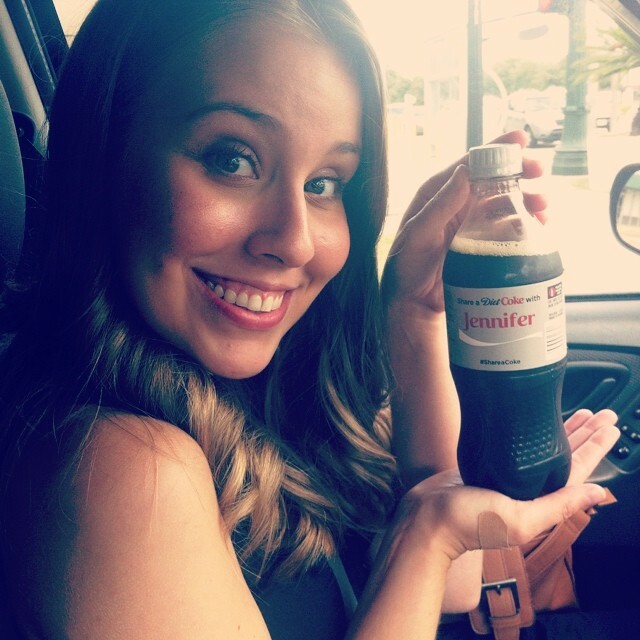 I have a client that does not drink coke and hasn't purchased one in over 2 years, until she found one with her name on it. Bravo Coca-Cola, bravo. Let's all learn a lesson from Coca-Cola and this campaign. They didn't change anything about their product, they just took the time to learn their audience and personalize it to them. They stopped making it about them, and focused on their customers instead. What does this campaign make you want to change about your own marketing? Leave me a comment below, I'd love to hear!